Thank you Dicky! This 2013 'Museums and Artifacts' FDC shows museums, and under thermochromic ink, their artifacts. Once exposed to heat, the black ink turns translucent and the hidden artifacts are revealed. For other thermochromic stamps check out this website. Thank you A'ishah! Two more stamps from the 10v series above. 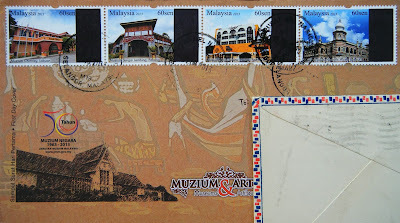 From left to right: The oldest museum of the set, Perak Museum, was built in 1883 and houses anthropological and geological specimens, look below and an elephant skull appears. Next is the National Museum with a Bronze Dongson Bell. Why did Pos Malaysia go to this trouble? Did they already have heat-sensitive machinery?Were there massive forgery problems? To tap into the 'unusual stamps' collector market? How much does this ink add to the cost of manufacture? Is the black meant as a curation statement - the artifacts can only be admired after the viewer understands the importance of where they are held, and the context the museum provides? Interesting item for sure, whether or not we shall see an increase in this security feature remains to be seen.